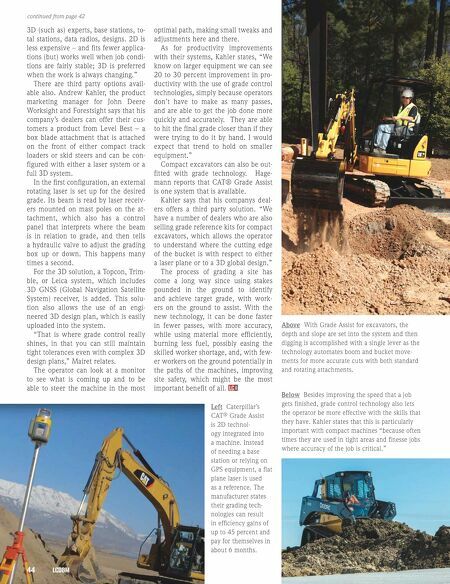 44 LCDBM continued from page 42 Above With Grade Assist for excavators, the depth and slope are set into the system and then digging is accomplished with a single lever as the technology automates boom and bucket move- ments for more accurate cuts with both standard and rotating attachments. Below Besides improving the speed that a job gets finished, grade control technology also lets the operator be more effective with the skills that they have. Kahler states that this is particularly important with compact machines "because often times they are used in tight areas and finesse jobs where accuracy of the job is critical." 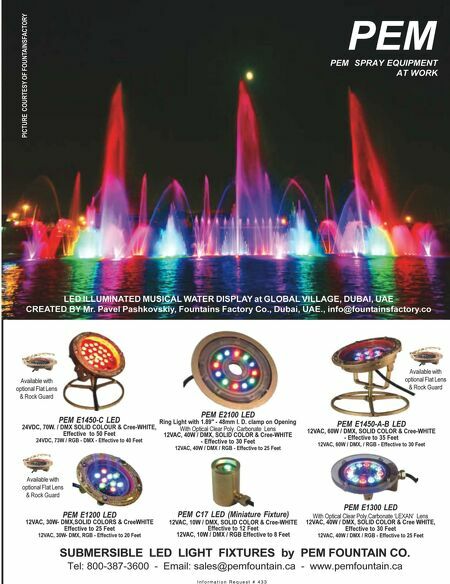 3D (such as) experts, base stations, to- tal stations, data radios, designs. 2D is less expensive – and fits fewer applica- tions (but) works well when job condi- tions are fairly stable; 3D is preferred when the work is always changing." There are third party options avail - able also. Andrew Kahler, the product marketing manager for John Deere Worksight and Forestsight says that his company's dealers can offer their cus - tomers a product from Level Best – a box blade attachment that is attached on the front of either compact track loaders or skid steers and can be con - figured with either a laser system or a full 3D system. In the first configuration, an external rotating laser is set up for the desired grade. Its beam is read by laser receiv - ers mounted on mast poles on the at- tachment, which also has a control panel that interprets where the beam is in relation to grade, and then tells a hydraulic valve to adjust the grading box up or down. This happens many times a second. For the 3D solution, a Topcon, Trim - ble, or Leica system, which includes 3D GNSS (Global Navigation Satellite System) receiver, is added. This solu- tion also allows the use of an engi- neered 3D design plan, which is easily uploaded into the system. "That is where grade control really shines, in that you can still maintain tight tolerances even with complex 3D design plans," Mairet relates. The operator can look at a monitor to see what is coming up and to be able to steer the machine in the most optimal path, making small tweaks and adjustments here and there. As for productivity improvements with their systems, Kahler states, "We know on larger equipment we can see 20 to 30 percent improvement in pro - ductivity with the use of grade control technologies, simply because operators don't have to make as many passes, and are able to get the job done more quickly and accurately. They are able to hit the final grade closer than if they were trying to do it by hand. I would expect that trend to hold on smaller equipment." Compact excavators can also be out - fitted with grade technology. Hage- mann reports that CAT® Grade Assist is one system that is available. Kahler says that his companys deal- ers offers a third party solution. "We have a number of dealers who are also selling grade reference kits for compact excavators, which allows the operator to understand where the cutting edge of the bucket is with respect to either a laser plane or to a 3D global design." The process of grading a site has come a long way since using stakes pounded in the ground to identify and achieve target grade, with work - ers on the ground to assist. With the new technology, it can be done faster in fewer passes, with more accuracy, while using material more efficiently, burning less fuel, possibly easing the skilled worker shortage, and, with few - er workers on the ground potentially in the paths of the machines, improving site safety, which might be the most important benefit of all. LC DBM Left Caterpillar's CAT ® Grade Assist is 2D technol- ogy integrated into a machine. Instead of needing a base station or relying on GPS equipment, a flat plane laser is used as a reference. The manufacturer states their grading tech- nologies can result in efficiency gains of up to 45 percent and pay for themselves in about 6 months.